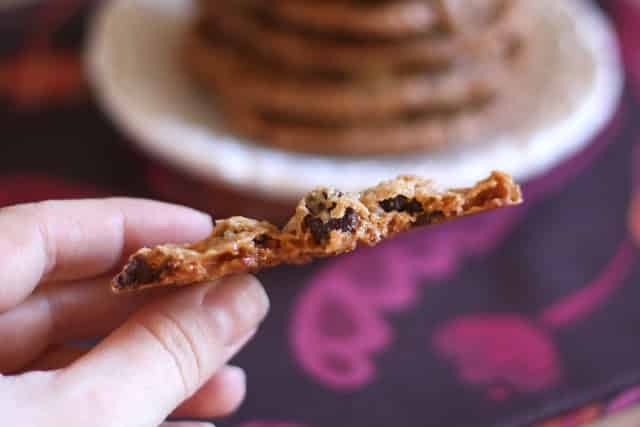 Toasted coconut, toffee bits and chocolate chips create an outstanding cookie with an unexpected crisp toffee surprise on the bottom of each cookie. 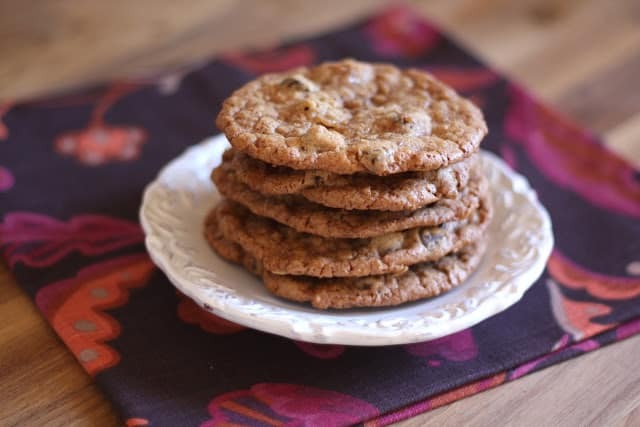 The cookies are extra chewy from the combination of coconut and toffee bits. Toasting the coconut for these cookies brought out a nutty, deep coconut flavor. I’ve made the cookies with and without toasting the coconut. The cookies are delicious both ways, but I am partial to the toasted coconut version. Preheat oven to 350 degrees. Line a baking sheet with parchment paper or a silpat mat and spread the coconut across it. Bake for 5 -7 minutes, until the coconut is lightly browned and toasted. Stirring once through the baking process. Set coconut aside to cool completely. Preheat oven to 350 degrees. Scoop 1 - 2 tablespoon size balls of cookie dough onto a parchment or silpat lined baking sheet. Bake for about 10 minutes, until the cookies begin to brown around the edges. Let cool for a minute on the baking sheets and then transfer to a wire rack to finish cooling completely. Enjoy! Scrumptious! I love that you're using alternative flours. These sound amazing! I love anything with toffee! Why have I never used toffee bits? I love how thin and crisp this cookie looks, with those chunky chips sticking out all over...yum! I saw this cookie this morning and have thought about it all day. I love toffee, love toffee, I mean really love toffee. I bet the toasted coconut seals the deal. Hope you had a wonderful Thanksgiving! Have a great week. You think I could use Pamela's baking mix for the GF flour? Omg I just made these and am so glad I doubled the recipe! 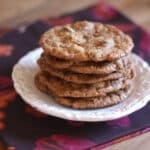 Best cookies I may have ever made and I love baking cookies! My stomach hurts and I still want to eat more! I also didn't realize how much these would spread out. Definitely keeping to Tbls size for the next batch! I was also bad and sprinkled a little truffle salt on top of the cookies in the middle of baking (forgot to do it earlier) and am in love! Delicious...but I used AP flour and mine did not flatten out as much as I would have preferred. Did I do something wrong or do the ones with AP flour come out a little differently? I will try to make again and add a bit more butter maybe?